Sometimes, one comes across a book that is charmingly simple and heart warming. A book that makes one pore into it again and again, finding a new nuance every time one looks at it. 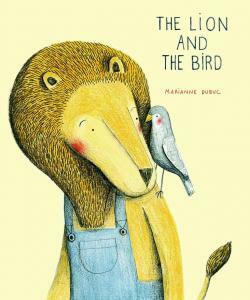 The Lion and The Bird is a book of friendship, seasonal nature of life, the yin & yang, loneliness & camaraderie. Life offers it all. This is a book that says the external environment hardly matters- If one finds true friendship, the winter is like spring. If ones loved ones are not around, even the most colourful spring season is cold and bleak. The autumn is almost on and the lion is working his patch of land, gathering the fallen leaves when he notices an injured bird(among many flying away to warmer lands). The bird is hurt. The lion takes in the bird, keeps it warm and develops a wonderful friendship with it. They enjoy the winter and suddenly the whiteness of the winter seems colourful. When it is spring again, the bird yearns to go back with its group of birds as they return back to their home. The number of pages are more (54 as against the usual 36 pages). The extra pages adds gravitas to the whole story. There are many pages that do not require any words. 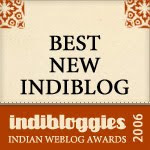 The design of the page conveys it all. There is a page where the birds flies away and the lion looks forlornly. The lion is illustrated same as ever before, but the page conveys the loneliness of the lion. The lion is depicted smaller in size, whereas the bird is depicted much larger compared to other pages. I wonder how long it took to illustrate and design this one single page - to convey the mood effortlessly. Every page is designed and illustrated with a lot of care and thought. It almost seems like the words used in the picture book are not needed at all. The words are used sparingly, but, I felt that they can probably be left out completely. I kept going back to the lion's face depicted in various pages. In some the lion appears forlorn, in some sprightly, in some enthusiastic, in some content. If one notices closely the lion's face is depicted almost exactly the same in all these pages. Then from where do these emotions come out. 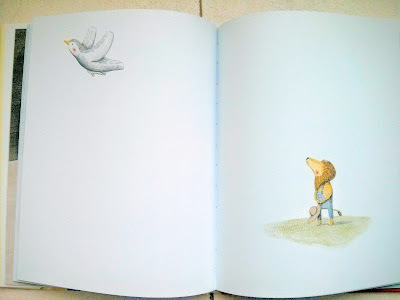 Do we as readers, sense the emotion of the picture and force our emotions on the page or is it a subtle magic of line used in the illustrations? This book is a work of art. A book for all ages. If I may add, a book more for adults than for kids. A book that will grow within you. A book that might provide a ray of hope for that lonely day when all seems bleak. A book that might turn out to be a classic.